Honda announced their new midsize SUV. 3.5L V6, same drivetrain as Pilot, 2 rows. 3500 lb towing can option to 5000 lb with AWD, so one class up from adventure Rav4. Safety sense standard, top view camera standard, 9 spd auto, no CVT. No info on MPG or pricing yet, out for early 2019. I can see some cross shopping between those that would opt for the Adventure grade or this. I think the styling is more on point with the adventure model and toyota probably has the edge on reliability, but the 3.5L V6 is very tempting! Any other thoughts from the crowd? Probably will have to test drive both and decide I think in the end. I’ve owned a bunch of Honda’s - 3 Accords, 2 CRVs, a Civic, and a Pilot. Honda’s used to be comparable to Toyota vehicles in reliability, but no more. I would especially be concerned about first year of a new model. That said, I liked my Pilot and the 3.5 engine is a good one and the performance should be excellent in a somewhat smaller vehicle. If a prospective buyer needed to tow more than the RAV can it would be worth considering. I would also expect the gas mileage to be similar to the Pilot, maybe a couple better, which is still not near as good as the RAV. So it’s a matter of what you need, or want. I personally am not in the market for any Honda’s I have seen, but at least this one has a NA 3.5 engine and an eight speed. Given Honda’s new found romance with turbo fours and CVTs its a nice change. Bigger then what I need. I myself find Honda design has gotten either strange or not really exciting but that is a personal choice. I think it will be more cross shop against the Highlander, Pilot and Ascent. Someone who wants more space than a Compact SUV but does not want or needs three rows. Exactly. And needs to tow. This is not an offroad vehicle by any stretch of the imagination. I like the new Passport & the new RAV4, there are certainly pros and cons for each, depending on each persons needs. I like the small footprint, handling, features, and mpg of the RAV, but I'm not crazy about the color selection for the Adventure models and I priced one out in the Build-your-own Toyota site and came out at $40,770, which is a ton for a entry level SUV. 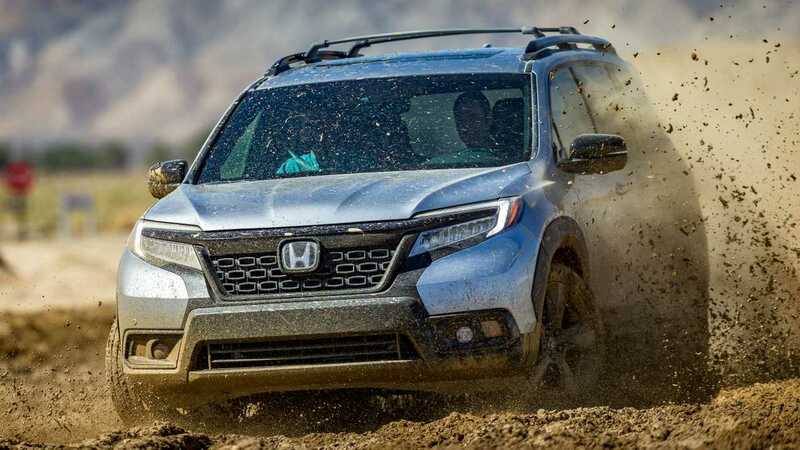 For the Passport, I like the bigger size, as I need to load it up for camping, and while neither is gonna climb Pike's Peak, I think the Honda will prove to be better off-road (gotta wait for the reviewers to get their hands on some actual models). I LOVE the added trunk (under the cargo area) feature of the Passport, I like the bigger engine, mpg (based on the Pilot getting 19city & 27highway) should be at least 20city and 28highway, which is fine with me since I don't drive much more than 6k miles/yr. I'm guessing, the interior is going to be nicer and leather seats are available. A nicely loaded Pilot can run in the $45k to $48k range, and I don't see the Passport being too much less than that, but if I price out one in the $43k/$45k range with leather and a 6cyl engine, it will make it an easy choice for me. It tows 3500 with FWD and 5000 with AWD and has a V-6. What more do you want? Only one RAV is rated to pull 3500# and that is extremely questionable with a four banger engine. I can't imagine how a small 2.5 liter would pull 3500# with only the addition of an atf cooler and oil cooler. I understand that Octane, we own two of them.. I'm speaking of the newer four cylinder only models vs the V-6 Passport since that's the comparison.